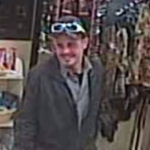 From the Montgomery County Sheriff’s Office: On Jan. 26, 2019 around midnight this man broke into the Shell Station on North Fork Road off Exit 128 at I-81, stealing lottery tickets and cash. He took time to check his lottery tickets and had a winner, so he stopped at 7-11 in Christiansburg to cash it in around 12:45am, where security cameras captured his face. It appears he was traveling down the I-81 corridor, due to break-ins at similar locations in Botetourt, Pulaski, and Rural Retreat. He was believed to be traveling in a white Dodge Caravan or similar vehicle. Multiple law enforcement agencies are looking for assistance in identifying this person, so if you know who it is, feel free to call Inv. JT Bowyer 540-382-6915 ext. 44417 or send us a message and we will get it to him.